A natural resource survey in 1996 showed that Mokre, a district of Mikołów (Poland), contains a unique natural environment. This was the beginning of Silesian Botanical Garden (SiBG), which have received permission from the Minister of the Environment in 2002. Since that moment SiBG is engaged in biodiversity conservation, ecological education and organization of cultural events for inhabitants of the Silesian Voivodeship. In 2011 SiBG has moved to the site of an abandoned military base on Sosnia Gora hill. The abandoned buildings were turned into the administrative centre, conference rooms, scientific laboratories and the library, topped with a viewing tower which is 14 meters high and from which there is a picturesque view of Upper Silesia and the Beskidy mountains. The centre is surrounded by a park. There are 20 ha of plant collections and 3 kilometres of recreational and educational trails. The park includes a playground built with ecological and user-friendly materials, open for children of all ages. 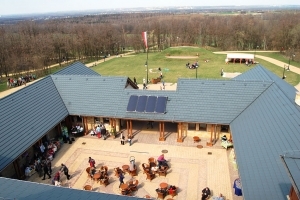 In 2012 the Silesian Botanical Garden (SiBG) celebrated its 10th anniversary. The idea to create a botanical garden in Mikolów arose in 1997. The impulse that led to its creation was a survey on natural resources performed in 1996, which showed that Mokre, a district of Mikolów, contains a unique natural environment. On an area of 5 km2 a wealth of habitats has survived: valuable forest stands of Fiolkowa Gora and two stream valleys: Promna and Jasienica; wetlands and farmlands with contour buffer strips which are now becoming increasingly rare, limestone excavation pits, ravines and hills, and hundreds of species of plants and animals, including rare and protected ones. Nowadays, such a wide array of habitats is seldom to be found within a single area. This location turned out to be perfect for the creation of a botanical garden, one that is mostly created by nature itself. It was therefore unnecessary to recreate natural habitats, which is so often the case with botanical gardens founded within cities. The seat of the SiBG is the Centre for Ecological and Environmental Education of the Silesian Botanical Garden. An abandoned military base on Sosnia Gora hill was adapted for this purpose. The abandoned bunkers and garages were turned into the main building of the centre which contains the administrative infrastructure of the Silesian Botanical Garden, conference rooms, scientific laboratories and the library. The building is topped with a viewing tower which is 14 meters high and from which there is a picturesque view of Upper Silesia and the Beskidy mountains. The centre is surrounded by a park with a three-level playground constructed out of ecological and user-friendly materials which is open for children of all age. There are 14 plant collections (including habitat collections, a phenological garden, rhododendrons, grasses and ericaceous plants) and 3 kilometres of recreational and educational trails. 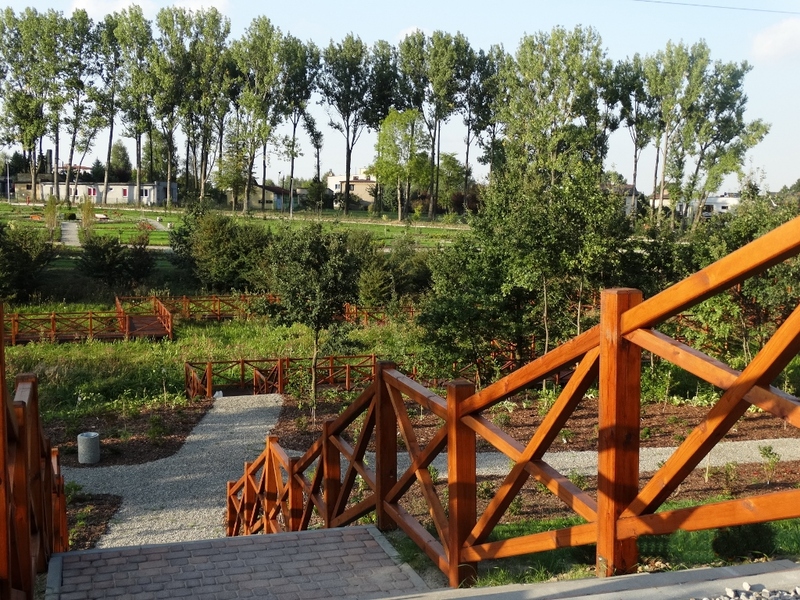 The garden consists of natural forest, meadows and two independent and fenced areas, which are all connected by bicycle path. You can also visit the Phenology garden (0.25 hectares), where especially chosen plants make it easy to comparie different seasonal characteristics. There is also dry river garden (0.3 ha) – rocks of various sizes have been carefully positioned to create the illusion of flowing water. Very interesting is the green wall (vertical garden) – created in 2011 inside the building, consisting of 25 exotic plant species located on 8 m2. There is a number of thematic events across the year related to budbreak, the flowering period, fruiting, autumn leaf colour change and leaf drop. This site also hosts the collection of temperate deciduous trees and shrubs (5 ha), the collection of temperate coniferous trees (1.5 ha), a pine forest (1.5 ha), the xerothermic grassland (2 ha), the collection of rhododendrons (1 ha), heath (1.5 ha) and a climbing plants collection (35 species and varieties). The second site, the area of the Children’s Environmental Education Centre also covers 20 hectares. This part of the garden was opened for visitors on 31st July 2015. The most interesting part of this area is the terraced garden: 6 terraces located on the hill, with educational gazebo, stream and small bridge. This garden is connected to the floral garden with many rhododendron varieties, a small French formal garden and collections of blue/yellow, white/pink and red/orange plants. Visitors are invited to use a long and winding viewing platform crossing a natural Molinia meadow. Other sections include the collection of ornamental grasses with a labyrinth for children, the aquatic plants collection with four ponds showing plants living submerged in water or at the water’s surface and the collection of energy plants with some of the most popular species used in energy production. There is a growing collection of trees and shrubs, including a collection of temperate deciduous and coniferous trees and a heath collection of Calluna varieties with some coniferous species. Very attractive is the preservation collection of traditional fruit tree varieties, which was established in 2005 and is one of the most important collections. 216 specimens of apple trees of 127 varieties were planted, all of which came from the Polish Academy of Sciences Botanical Garden – Centre for Biological Diversity Conservation in Warsaw-Powsin. In the following years the collection was expanded through successive plantings and now consists of 594 apple trees of 276 varieties, 26 cherry trees of 6 varieties, 8 sweet cherry trees of 4 varieties, 21 pear trees of 8 varieties and 28 plum trees in 8 varieties on an area of 2.38 ha. Since 2010, a plant nursery for fruit tree rootstocks is being developed in the orchard, where scions are grafted. The scions were collected from old varieties of trees during field expeditions to old orchards and private gardens. Owner/Management: Non-governmental organization, founded as a association of societies. Admission prices: Admission to the garden is free to all visitors. Parking: Car-park with 150 parking spots (no charge) and 80 parking spots on a bicycle parking. Events, exhibitions: Various events throughout the year from photography exhibitions to ecobazaar and Silesian Ecological Calendar events. More details on the website. Tea Room / Restaurant: Tearoom with seating both inside and outside. The tearoom is next to the playground. Sale of souvenirs too. Toilets: Toilet facilities (including disabled toilet) available by the tearoom, in the main building and in the gatehouse. Changing table available by the cafeteria. Map of the site, additional information: A free leaflet with map available in the garden and on the website. Signage on site and on selected plants: Information boards are located in many places of the garden. Signage is on most plants. By car: 10 minute drive from Mikołów centre and 30-40 minutes from Katowice City centre. By bus: 2 buses from Mikołów centre which stop near to the main gate of the garden. It takes 15 minutes. From Katowice it is necessary to get to Mikołów centre first. By bicycle: Visiting the garden by bike is possible owing to new cycle routes, which connect Mikołów, Orzesze, Łaziska Górne, Wyry and Ornontowice and also Katowice. Bikers can get to the garden and also to come across the wild area of the garden.